What are the benefits of our consultancy and training on BRC food packaging standard? Increases product safety and quality. Achieves recognition and acceptance from the UK retailer community. Proactive approach – identifying and controlling food safety hazards. Increased confidence for customers / consumers. Listing on BRC Directory of certified companies. Recognition by the majority of UK supermarket retailers and reduce audits from them. We offer BRC food packaging Training Presentation which is prepared by a team of highly-qualified management professionals and experienced BRC food packaging consultants. This BRC food packaging training presentation slides are very useful while conducting corporate training on BRC food packaging within the organization or any work area. Our many clients in the UK, USA and many other countries have already used this BRC food packaging ppt for providing BRC food packaging training to their employees. This BRC food packaging training presentation kit is pleasingly designed and presented to clearly communicate the message and establish a much better understanding. Our custom-designed PowerPoint presentation meets the requirements of new version of BRC food packaging standard and our more than 200 clients globally are already certified to BRC food packaging standard and successfully implemented Quality Management System within their organizations. What Does BRC Food Packaging Awareness Training Presentation Kit Offer? 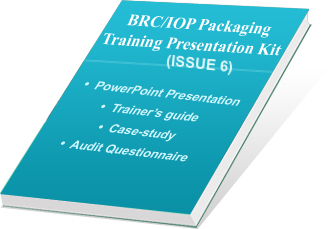 BRC Food Packaging Training Presentation Kit contains total 271 slides in two parts - training presentation and literature for participants’ further learning. Overview of Global Standard for Packaging. BRC Global Standard for Packaging requirements in detail. BRC Food Packaging implementation steps. This part comprises approximately 300 slides to get the message over, and establish a much better understanding of BRC Global Standard for Packaging. The slides also describe how to tackle it and drills down into all the relevant topics. Overview of BRC Standard for Packaging and Packaging Materials. Elements of BRC global packaging management system. Department-wise audit questionnaire as per BRC Global Standard. Handouts are written in MS Word 2007 and Presentation are made in Power point. Developed under the guidance of experts and globally proven consultants having experience of more than 25 years in certification consultancy. User-friendly and easy-to-learn; one can add company logo as well as voice for the training of staff. Our products are highly sold globally and used by many multinational companies and have provided total customer satisfaction. During preparation of training kit, it is been verified and evaluated at various levels and more than 1000 hours are spent in preparation of this training kit. On successful completion of secured purchase we provide username and password to download the product from our FTP server. We provide instant online delivery of our products to users by sending username and password by e-mail. BRC Packaging Standard Awareness Training Presentation Kit is available at a very compatible rate and anyone can purchase it by secure online transaction with Paypal.com. We ship worldwide and our products are used in more than 65 countries.